BARCELONA — The escalating confrontation over Catalonia’s independence drive took its most serious turn on Saturday as Prime Minister Mariano Rajoy of Spain announced he would remove the leadership of the restive region and initiate a process of direct rule by the central government in Madrid. The steps were immediately condemned by Catalan leaders and risked further inflaming an already volatile atmosphere in the prosperous northeastern region. On Oct. 1, thousands braved national police wielding truncheons to vote in a contentious independence referendum for Catalonia, even after it was declared illegal by the Spanish government and courts. The lesson of Fort Sumter – don’t be the one to fire the first shot (and if nobody fires the first shot there won’t be any shots at all). Fueled by economic grievances and a distinct language and culture, aspirations for an independent state in Catalonia have ebbed and flowed for generations. But the current confrontation has presented a vexing quandary not only for Spain but the entire European Union, pitting demands for self-determination against the desire to preserve the sovereignty and territorial integrity of an important member state. Mr. Rajoy took the bold steps with broad support from Spain’s main political opposition, and will almost certainly receive the required approval next week from the Spanish Senate, where his own conservative party holds a majority. He did so despite repeated appeals for dialogue and mediation by the Catalan leader, Carles Puigdemont, whose independence drive has been shunned by wary European Union officials. Mr. Rajoy said the Catalan government had never offered real dialogue but had instead tried to impose its secessionist project on Catalan citizens and the rest of the country in violation of Spain’s Constitution. Mr. Rajoy said he planned to remove Mr. Puigdemont, and the rest of his separatist administration from office. The central government was also poised to take charge of Catalonia’s autonomous police force and the Catalan center for telecommunications. Mr. Puigdemont led a mass demonstration of 450,000 people in Barcelona, the region’s capital, on Saturday afternoon. In a part of his speech delivered in English, Mr. Puigdemont also addressed Europe’s politicians and citizens and suggested Europe’s “foundational values are at risk” in the dispute with Madrid. “Democratically deciding the future of a nation is not a crime,” he argued. Other Catalan separatist politicians warned that Mr. Rajoy’s announcement would escalate rather than resolve the conflict. 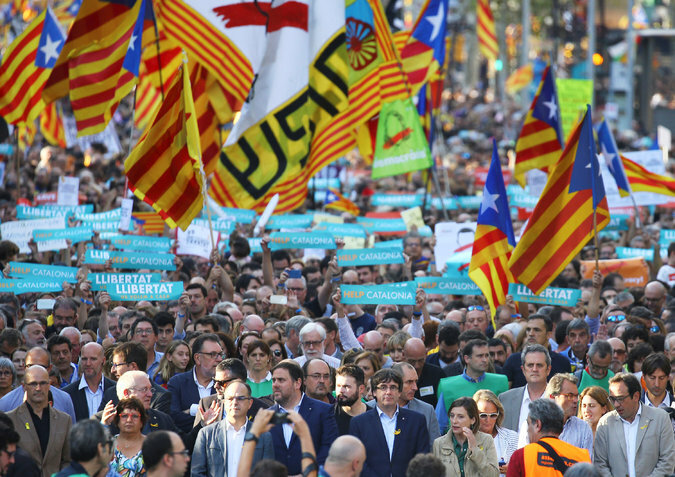 Crowds gathered for a mass protest in Barcelona on Saturday evening. Oriol Junqueras, the region’s deputy leader, said in a tweet that Catalonia was “facing totalitarianism” and called on citizens to join the Barcelona protest on Saturday. Davant el totalitarisme, avui més que mai, defensem la democràcia i els drets civils i polítics. Ens hi trobarem! Significantly, Iñigo Urkullu, the leader of the Basque region, which also has a long history of separatism, described the measures as “disproportionate and extreme,” writing on Twitter that they would “dynamite the bridges” to any dialogue. Faced with Madrid’s decision to remove him from office, Mr. Puigdemont could try to pre-empt Mr. Rajoy’s intervention and instead ask Catalan lawmakers to vote on a declaration of independence in coming days. Mr. Puigdemont could also then try to convene Catalan elections, on his own terms, to form what he could describe as the first Parliament of a new Catalan republic. His government has been flouting Spain’s Constitution since early September, when separatist lawmakers in the Catalan Parliament voted to hold a binding referendum on independence, as a key step toward statehood. An alliance of separatist parties has controlled the Parliament since 2015, after winning regional elections, but with only 48 percent of the vote. Should Mr. Puigdemont resist Mr. Rajoy’s plans, Spain’s judiciary could separately step in and order that he and other separatists be arrested on charges of sedition or even rebellion for declaring independence. Rebellion carries a maximum prison sentence of 30 years. Earlier this week, a judge from Spain’s national court ordered prison without bail for two separatist leaders, pending a sedition trial. Using Article 155 “was neither our desire nor our intention,” Mr. Rajoy said on Saturday, but had become the only way to to return Catalonia to legality, normality and maintain a Spanish economic recovery “which is now under clear danger because of the capricious and unilateral decisions” of the Catalan separatist government. 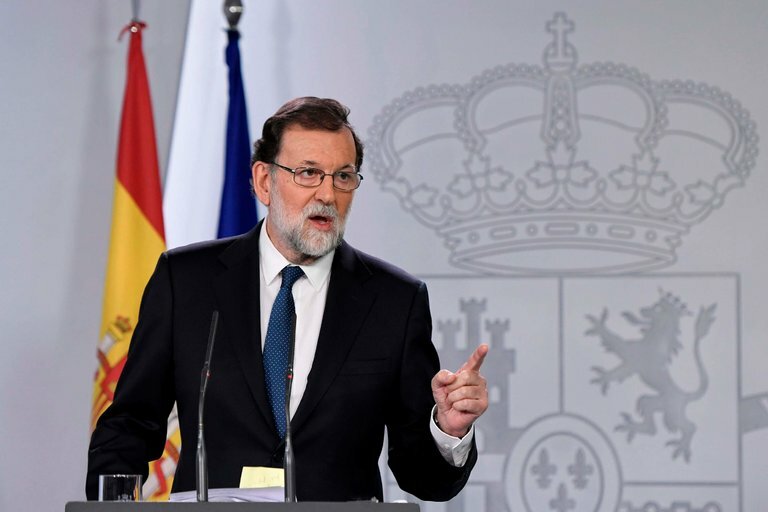 Mr. Rajoy highlighted the decision of over 1,000 Catalan companies this month to relocate their legal headquarters outside the region, in response to the uncertainty generated by the possibility of a breakup with Madrid. Mr. Rajoy received strong backing from politicians from the main opposition parties, with the notable exception of Podemos, the far-left party that wants to use a referendum to convince Catalan voters to remain within Spain. “We’re shocked by the suspension of democracy in Catalonia,” Pablo Echenique, a senior official from Podemos, said in a news conference on Saturday. Catalan President Carles Puigdemont will ask the region’s parliament to discuss Spain’s attempt to curb Catalan self-government, he said Saturday in a televised address. “The Catalan institutions and the people of Catalonia cannot accept this attack,” he said. He did not announce Catalan independence in the statement. Nearly half a million people took to the streets Saturday in Barcelona, waving flags and banners in support of Catalonia’s independence from Spain. Catalan President Carles Puigdemont was among the protest crowd, which police estimated at 450,000 people. He was scheduled to speak later Saturday. The unprecedented constitutional measures — intended to end Catalan leaders’ independence bid — fall under Article 155 of the Spanish constitution and would have to be sent to the Spanish Senate for approval. This would happen within the next week, Rajoy said. 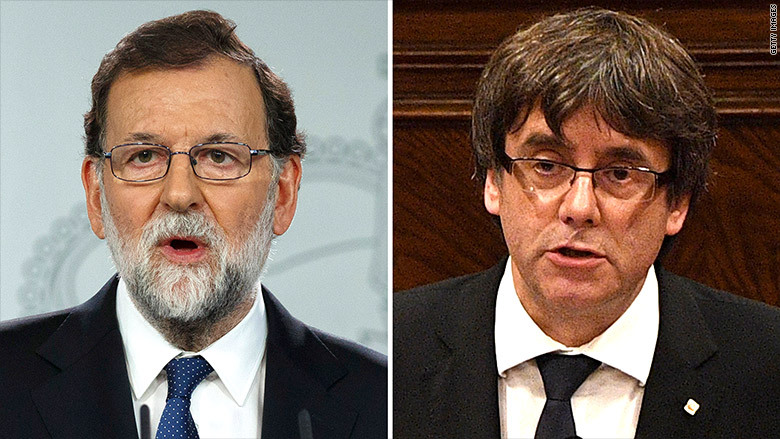 Rajoy, left, called Saturday for the removal of Catalan President Carles Puigdemont. The move followed weeks of division triggered by a banned independence referendum on October 1. 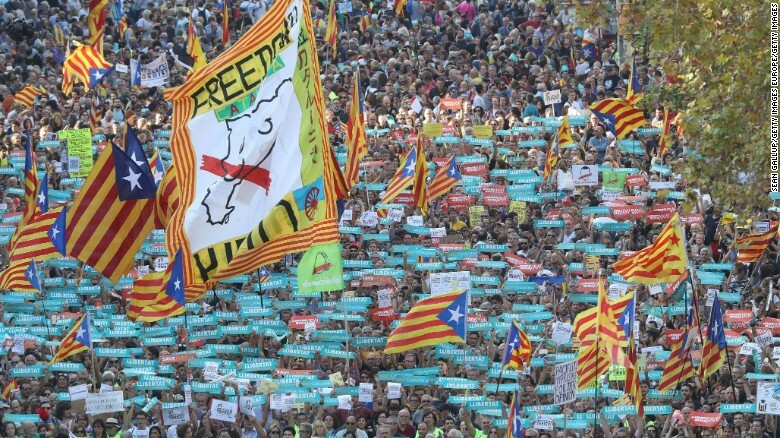 Nearly 7.5 million people live in Catalonia. Spain’s population is almost 49 million. In undertaking these steps, the government has four goals, Rajoy said. These are: to return to legality; to restore normality and coexistence in Catalonia; to continue the region’s economic recovery; and to hold elections under normal conditions. 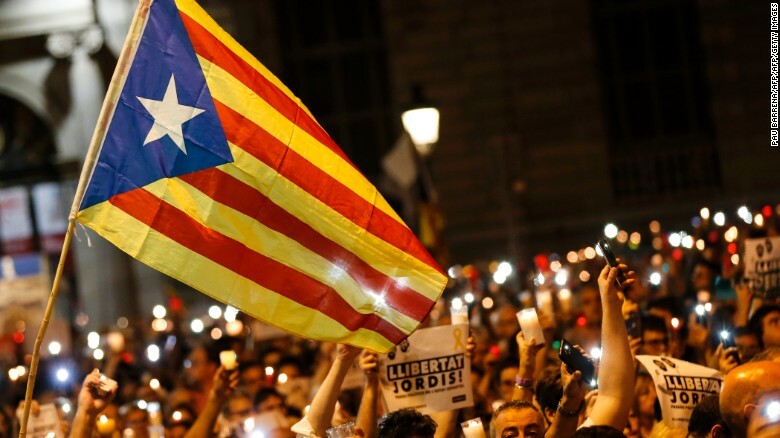 The crisis threatens to fracture Spain, one of the European Union’s principal members, and has prompted mass public protests in Catalonia and elsewhere. “Today President Rajoy, in an act of enormous political irresponsibility, trespassed all limits. He announced a de facto coup d’etat with which he aims to take over Catalan institutions,” said Catalan Parliamentary leader Carme Forcadell. People hold candles and a Catalan flag during a demonstration in Barcelona against the arrest of two Catalan separatist leaders on October 17. Marchers demand the release of imprisoned Catalan leaders Jordi Sanchez and Jordi Cuixart on Saturday in Barcelona. CNN’s Claudia Rebaza reported from Barcelona, while Laura Smith-Spark wrote from London. CNN’s Erin McLaughlin, Lorenzo D’Agostino, Sebastian Shukla and Joe Sterling contributed to this report. The Spanish government has said any unilateral declaration of independence would be illegal and has promised action “to restore law and democracy”. Catalan leader Carles Puigdemont on Tuesday proclaimed the region’s independence from Spain but said its effects would be suspended to allow for talks with the Madrid government. “I assume the mandate that Catalonia should become an independent state in the form of a republic … I propose suspending the effects of the declaration of independence to undertake talks to reach an agreed solution,” Puigdemont told the regional parliament in Barcelona. Though Puigdemont stopped short of seeking the explicit support of the chamber for the declaration of independence in a vote, a move that would have closed the door to any negotiated solution, the declaration plunges Spain into the unknown. The Spanish government has said any unilateral declaration of independence would be illegal and has promised action “to restore law and democracy” if the parliament of the autonomous and affluent northeastern region presses ahead. The Madrid government could also ask the courts to strike down a declaration of independence as unconstitutional. Despite renewed calls for dialogue with Madrid, the proclamation makes a negotiated solution more difficult as Rajoy has said he would not talk to the Catalan leaders until they drop plans for independence.